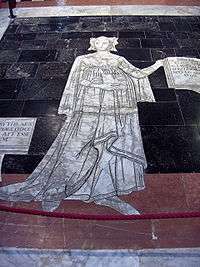 The Erythraean Sibyl was the prophetess of classical antiquity presiding over the Apollonian oracle at Erythrae, a town in Ionia opposite Chios, which was built by Neleus, the son of Codrus. The word Sibyl comes (via Latin) from the ancient Greek word sibylla, meaning prophetess. Sibyls would give answers whose value depended upon good questions - unlike prophets who typically answered with responses indirectly related to questions asked. There were many sibyls in the ancient world, but this oracle prophesied Alexander the Great's divine parentage, according to legend. Presumably there was more than one sibyl at Erythrae. One is recorded as having been named Herophile,. At least one is said to have been from Chaldea, a nation in the southern portion of Babylonia, being the daughter of Berossus who wrote the Chaldean history, and Erymanthe. Apollodorus of Erythrae, however, says that one who was his own countrywoman predicted the Trojan War and prophesied to the Greeks both that Troy would be destroyed and that Homer would write falsehoods. In Christian iconography the Erythraean Sibyl sometimes appears as one who prophesied the Redemption. Examples were in mediaeval paintings in Salisbury cathedral, and others are shown in the illustrations on this page. ↑ Modern Gothic by Alexander Murray: Times Literary Supplement 24 October 2008 page 8. 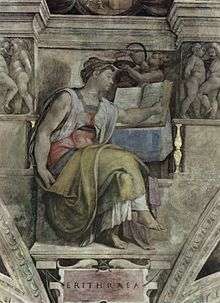 Wikimedia Commons has media related to Sibyl of Erythre. This article is issued from Wikipedia - version of the 1/24/2015. The text is available under the Creative Commons Attribution/Share Alike but additional terms may apply for the media files.